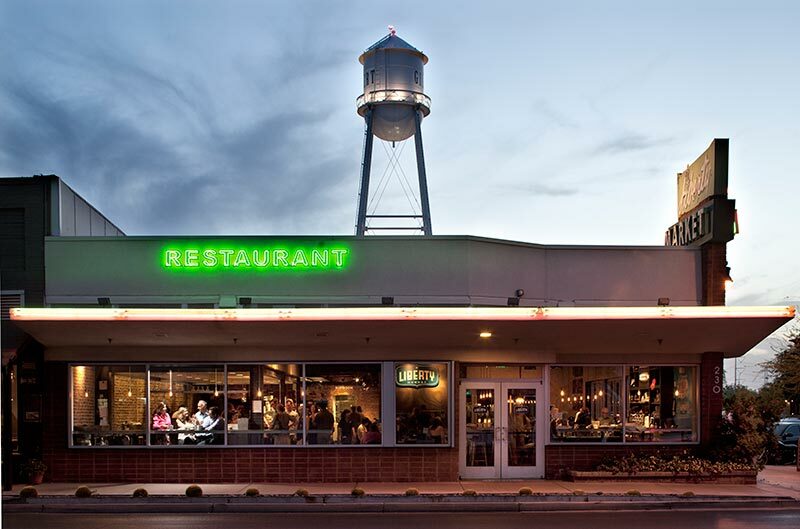 Liberty Market is an unpretentious urban bistro, located in the heart of Old Town Gilbert. The building itself has been in existence since the early 1930s serving Gilbert as a grocery store. Ben Ong, a Chinese immigrant, began working at the store in 1936 and then purchased the store with his wife Mae Ong in 1943. The Ongs modernized and doubled the store’s size in 1958, and then operated it until 1981. Even in 1981, Gilbert had only 6,000 residents and there wasn’t another grocery store within 15 miles. Today, Liberty Market is an award winning, Zagat-rated restaurant serving a diverse and refined menu featuring wood fired pizza, sandwiches, salads, burgers, pasta, gourmet style entrees, house-made desserts, and features a premium espresso bar and diverse beer+wine list. Liberty Market serves breakfast, lunch, and dinner seven days a week, and has become a favorite meeting and eating place for families, friends, and business people alike. Even the one-of-a-kind bathrooms have won awards!